Posts tagged "social media scheduler"
Are you a small business looking to manage your brand’s social media without needing to drop thousands of dollars per month? Are you a freelance social media manager who is sick of wasting money on expensive social media schedulers? Then you came to the right place. Socialdraft’s FREE FOREVER plan is just the thing. You can stop your search for the best free social media management tool because this is it! Use the visual calendar to easily see what has posted and what is scheduled for the future. Manage all your social media content in one place. Schedule posts individually or in bulk via CSV. Schedule recurring posts for Facebook Business Pages, Instagram, and LinkedIn Pages. Engage your community on Facebook, Twitter, and LinkedIn on the all-in-one inbox. Create campaigns (groups of social networks) and schedule posts to those campaigns. Use your Bitly account to shorten links. Pull unlimited reports for Facebook and Twitter. Socialdraft is the only calendar based social media tool that lets you post to multiple social networks free, pull analytics reports, engage your audience, AND do it all with ease. 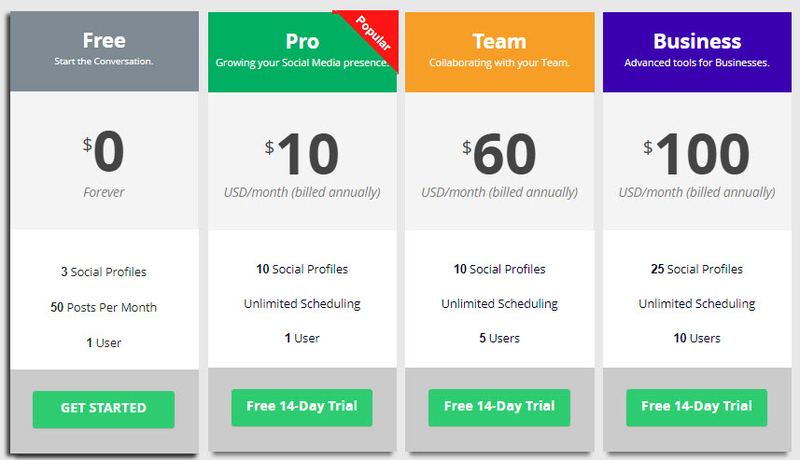 Socialdraft is a simple and affordable social media tool. Is a Credit Card Required for Socialdraft Free Forever? No, we do not require a credit card for the Socialdraft Free Forever plan. If you decide that you would like to upgrade to one of the paid plans, let us know on support. You can always go back to Free Forever if you change your mind. Is it Really Free Forever? Yup. Sign up and you’ll have access free forever. If you’re ready to sign up for the Socialdraft Free Forever Plan so you can have access to our free social media management tool for the rest of your life, sign up here. Is There A Tutorial On How to Use Socialdraft? Of course, just watch the video above to learn how to use the basic features of our free social media tool. Socialdraft is your all-in-one social media tool for teams. Our goal is to simplify the tasks teams collaborating in Social Media have to perform. It’s a Hootsuite alternative with plenty of features. You maybe be asking how it compares to the current generation of social media tools. Glad you asked! Here is a quick calculator. How is Socialdraft different than Hootsuite? Like Hootsuite, Socialdraft allows you to schedule posts to be shared on social media (with support currently for Twitter; Facebook profiles and pages; Instagram, Pinterest, and LinkedIn business pages). Socialdraft, however, has several major differences from Hootsuite. Both Hootsuite and Socialdraft allow for social media management via uploading new content and manually and Bulk scheduling it to go out to one or multiple social accounts at any specific time. In Hootsuite, you also have the option of using the Auto Scheduler, which gives the app control of your posting schedule, so it decides for you when it will post your content. This is similar to our TrueTime feature. But what happens if you want certain updates to go out on certain networks at different times than what Hootsuite’s Auto Scheduler decides for you? While Socialdraft also allows you to upload your updates into a calendar, you have complete control over your posts. Want to move them around on the same day? Week? Month? It’s easy to do with a drag and drop. Want to repeat a post that performed incredibly well, simply drag and drop or duplicate it. This is true for all social accounts. Socialdraft does not provide the limit constraints on accounts that Hootsuite has in place. Socialdraft has six plans to fit different types of social media businesses. However, if you need more social media accounts just message us on support and we’ll create a custom plan for you. Both Hootsuite’s Free and Pro plans limit how many messages you can have in your queue at any given time, and you’ll pay more if you need to schedule content above the limit. With Socialdraft there are no limits as to how much content you can schedule. Socialdraft also allows you to pull as many reports as you need to pull whenever you need to pull them. One of the things we are focused on is User Experience. Socialdraft was conceived after constant feedback from avid social media users who hated the current generation of social dashboards today. We listened and designed Socialdraft to be a simple calendar system with some robust technology under the hood. You can still do posting, csv uploading, view and comment on posts in real-time. We designed this with the user in mind. Should I use Hootsuite or Socialdraft? So now that you know how Socialdraft is different from Hootsuite, which tool is right for you? Should you use Hootsuite or Socialdraft to manage your social media? You tend to share only one type of post and don’t need complete control of your posting schedule. You have time to continually add content and manage your queue daily. Enjoy having lots of clutter on your screen. You have a large complex team that requires multiple levels of approval and collaboration such as assigning different tasks. You manage various accounts and need a simple way of visualizing what is scheduled. You have don’t have time to continually add content and manage your queue daily. You’re a visual person who prefers quality over quantity. You don’t enjoy hidden costs as you add more profiles and scale your account. Are you curious about Socialdraft? Want to discover all the things we do so you can really choose us as a Hootsuite alternative? Take us for a spin. We offer a risk-free trial. This one is great for anyone who works with a team (or with a client that likes to micromanage). With collaboration, you can set up people in your team (and clients) so that they have access only to certain social accounts, and only to certain areas within those accounts. It’s super easy to set someone up and to remove them when needed. What kind of users can you set up? Admin: This is the person who owns the account (most likely you). This person has control over the entire dashboard and back-end items such as billing. Manager: This person can be given almost all access to the site, except for back-end items such as billing. Sub-User: A sub-user can be allowed to schedule and post content to a page. They can also be given access to Instagram tools, the Socialdraft Queue, the Engagement Inbox. Managed Sub-Users: These are almost the same as sub-users. The difference is that while they can schedule content, the content won’t publish unless it is approved by an admin. Guests: These are the users with the least power. Most of our users use this setting to give access to clients. Guests can access only the social networks you choose. They cannot edit, delete or re-schedule content, but they can leave notes on posts for your team. We love bit.ly as much as you do (especially since Tweets that useURLsS shortened with Bitly get significantly more re-tweets). That’s why you can now set up your custom bitly to track your social media performance. With campaigns, you can set up groups of social accounts. This allows you to schedule and post the same message to multiple social networks in just one shot. This suggestion came to us via our Facebook page. You can pull reports for Facebook AND Twitter. We even have white label options. Our drag and drop calendar allows you to schedule posts to Facebook, Twitter, and LinkedIn for as long as you like. You can schedule an entire month…even an entire year. It also allows you to drag & drop a post to reschedule it AND to duplicate posts you want to repeat. We kept hearing from you that you sometimes wanted to work on a social media post over the course of a longer period of time. We listened and have just released Socialdraft Draft Posts. Draft Posts allow you to work on a social media post over the course of a day, week, year, or as long as you want. This is great if you have special events coming up or new launches, but aren’t sure of the final specifics. Simply craft the post just like you would a regular post, but set it as draft in your Queue. It will show in your calendar and the Socialdraft Queue. From here you can change all sorts of things including the write-up, date and time, image, etc. Hope you enjoy this latest feature. If you’re ready to take Socialdraft for a spin, go ahead, we offer a risk-free trial. What Else Does Socialdraft Do? Socialdraft is a social media scheduling tool for teams that handle lots of clients and lots of social media accounts. As such, our users needed ways to easily see what is going on only for particular clients. That is where Socialdraft campaigns come in. “Joe’s Restaurant Location 1 All”: You can create a campaign where you put all of Joe’s restaurant’s social networks: their Facebook page, Twitter account, and Instagram account. Whenever you want to see what is scheduled for all networks, simply drill down by this campaign. Whenever you want to schedule a post about their weekly happy hour to all their social networks, simply schedule it to that campaign. When you want to download their calendar to send to them for approval, drill down by the campaign, download, and send it out as PDF. Joe’s Restaurant All Locations Twitter: If Joe’s restaurant has 3 locations in the same state, and they are all running the same promotion, you can group all of Joe’s restaurant location’s Twitter accounts into one Campaign. You can do all of the above, but this time it will only apply to their Twitter accounts. Brand/Business & Principals: Create a campaign for the brand or business PLUS the principals (owners, founders, etc). When a new review comes in, simply share it to all their social networks using Campaigns. What Else Can You Do with Socialdraft? If you are curious about Socialdraft and any of its features, just click this link. If you’re ready to take us for your risk-free trial, simply click here to find the perfect plan for you. 8. Choose repeat cycle (click each month you want this post to come out. What Else Does the Social Media Tool Socialdraft Do?